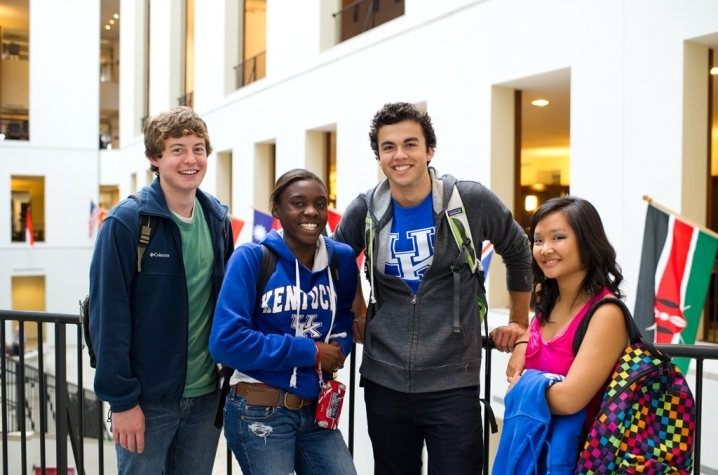 LEXINGTON, Ky. (Sept. 12, 2012) ― The University of Kentucky's largest-ever first-year class is also its most academically talented in history with the highest number in memory of National Merit Finalists and record numbers of Singletary Scholars and Governor's Scholars. As such, this first-year class represents a key investment, President Eli Capilouto told members of the Board of Trustees Tuesday, in fulfilling the Kentucky Promise. "This board, nearly a year ago, provided a clear direction for our future ― to ensure that the best possible undergraduate experience awaits Kentucky's sons and daughters," Capilouto said. "An important part of that is growing our student population, increasing our commitment to diversity and recruiting talented students from Kentucky and the region who will grow together ― with the help of an exemplary faculty and staff ― to be our state's best and brightest. "This first-year class provides resounding proof that we are moving in the right direction on all those markers ― opening doors of potential and possibility for these students and for our Commonwealth's future." 71 National Merit/National Achievement Finalists ― up from 29 last year. That number, using last year's figures, would place UK among the top 15 public schools in the country for National Merit Finalists. A record number of Singletary Scholars ― 51 ― up from 34 last year, a reflection of increased investment by Capilouto and the board in scholarships. The funding for the increase in Singletary Scholars came from UK's Athletics Department, which now contributes about $3 million annually for academic scholarships. 309 Honors Program students, up from 226 last fall ― also a commitment of Capilouto and the Board of Trustees to increase the opportunities students have in constructing a challenging curriculum that prepares them to compete and succeed when they graduate. 427 students who were in either Governor's Scholars or Governor's School for the Arts ― up from 394. Capilouto noted that even as the first-year class has grown by more than 500 students this academic year, the average ACT score has maintained the university's highest-ever mark of 25.5 and the number of students with ACT scores ranging from 26 to 36 is at record levels. 533 African-American first-year students, a 26 percent increase; 1,839 undergraduates now are African-American students, an 11 percent increase. 166 Hispanic first-year students, a 44 percent increase; 573 undergraduate students are Hispanic, a 26 percent increase. 110 first-year students with international backgrounds ― a 96 percent increase; 524 undergraduates are international students, a 27 percent increase. 4,645 first-year students, up from 4,139 last year; 69 percent of the students are from Kentucky; 31 percent are from out-of-state. Capilouto said that one of the hallmarks of this class is that there are more students from both Kentucky and out-of-state as well as internationally ― all signs of strength and diversity. A total enrollment of 28,935 with 20,882 undergraduate students ― both record enrollments. A record number of applications at 18,802 ― a 24 percent increase from last year. Capilouto said there is an increasing recognition among families and students in the region that UK is deeply committed to undergraduate education ― in terms of the quality of its curriculum and building living, learning and research facilities that will help students maximize their potential. "This class is a testament to the work of our faculty and staff ― particularly our enrollment management team, whose tireless efforts are critical to student recruitment efforts ― and to the commitment to excellence of our Board of Trustees," Capilouto said. "To fulfill the Kentucky Promise, to be a beacon that lights the way for our state's future, we must be the school of choice for students and families in this state and in this region. "One of the clear stories behind today's numbers is that increasingly we are that school of choice." To view a PowerPoint presentation on enrollment, click here.